in the subtlest, most dignified manner imaginable . . .
, as the guest of honor will be none other than the supremely dashing Mr. M., who has taken leave of his large, shaded patio in the south of France for an all-too-brief visit to the Midwest. Fruited Champagne Jelly Mold should be perfect - sounds kinda sophisticated, is light and refreshing for a hot afternoon, and is not, too too boozy (important for this event as the champagne will likely be flowing and Intern Doug will be shaking and pouring French 75s until his arms seize up.) The internal garnish of fruit (red berries! blueberries!) provides venue for a discreet display of nationalist pride, without bonking anyone over the head with such. Lightly spray bundt pan with cooking spray. Wipe off the excess with a paper towel. A slight residue should remain, just enough to help unmold your gelatin, without affecting the taste or appearance. Pour 1 cup of the champagne and the sugar into a medium saucepan. Sprinkle with the gelatin allow to soak for a minute or two. Heat over low heat, stirring constantly, until the gelatin is dissolved (about 5 minutes). Remove from heat. Stir in the rest of the champagne and the schnapps. Pour 1 1/2 cups of the gelatin mixture into the prepared mold. Refrigerate until the gelatin is the consistency of egg whites (15 to 20 minutes). Stir in the blueberries and return to the refrigerator for 5 minutes. Place the sliced strawberries on top of the blueberry/gelatin layer, pouring a bit of liquid gelatin in over each layer, until the mold is full. (You may have a bit of gelatin left over.) Refrigerate until fully set (several hours or overnight). To unmold, fill a larger container or clean sink with warm water (not too hot!). 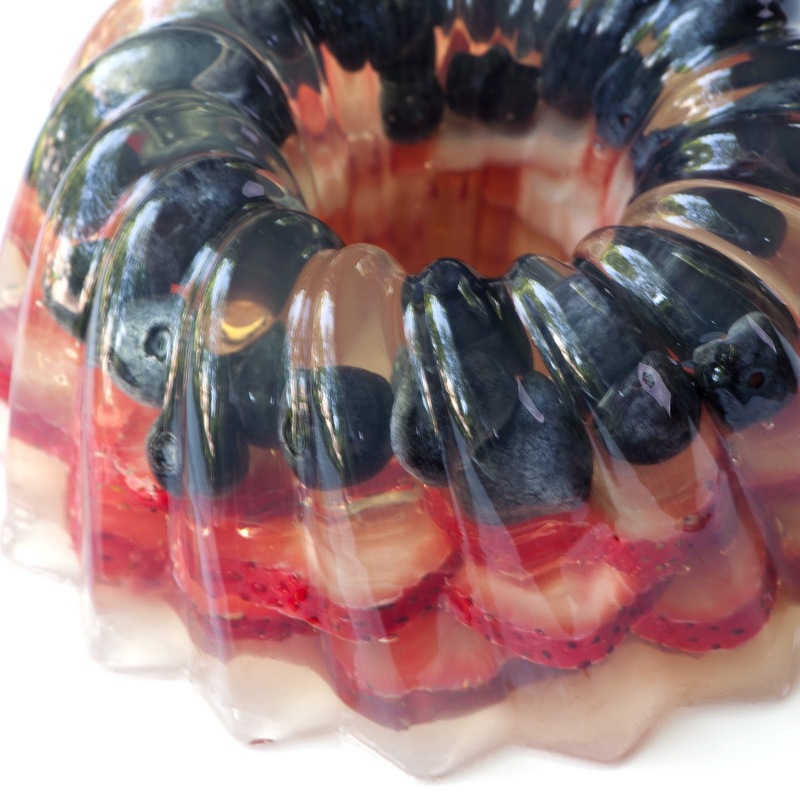 With clean fingers, loosen the gelatin around the edges of the mold. Next, dip the mold almost to the edge into the warm water for 10 seconds. Dry the bottom of the mold with a towel. Place your serving plate on top of the mold and invert. The gelatin should pop out. If not, return the mold to the warm water bath and repeat.